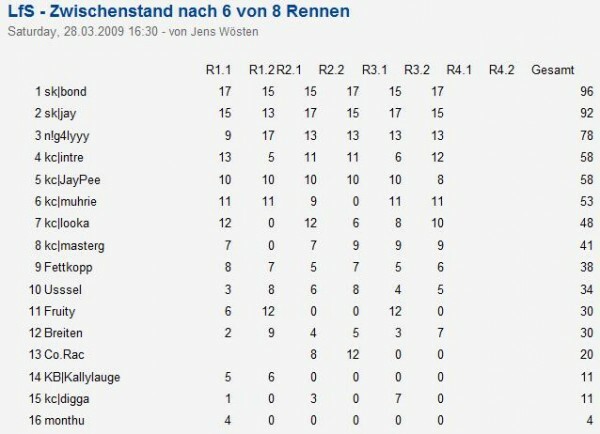 Already the first race showed that Hendrik 'b0nd' von Eye and Marco 'Jay' Schade are racing in another class than the others. It's also pretty sure, after three of four races, that they will finish in first and second place, only the question who will be on top at the end of the day is still open. b0nd showed awesome races especially in the GTRs, while Jay dominated the road cars. Behind SK, it is n!faculty g4ly, who has the best chances to complete the podium, but is still fighting against five Komacrew pilots that are ranked in 4th to 8th place. The last race, Sunday 11 am, will be driven in the BMW Formula One on Aston Grand Prix.